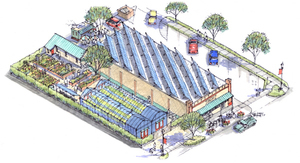 Project rendering of Mission Waco's Urban REAP community greenhouse, funded by Green Mountain Energy Sun Club. The Sun Club will fund the majority of the project, which will feature an aquaponics greenhouse, solar energy array, rainwater catchment and purification system, plus a commercial composting system and training center for educating school groups. The innovative greenhouse will be built adjacent to Mission Waco’s recently-opened Jubilee Food Market. Mission Waco, the Sun Club and members of the community broke ground on the new site on January 18, 2017. Mission Waco was founded in 1992 to empower low-income residents by providing support through a variety of assistance programs. The organization seeks to assist the poor through education, training, rehabilitation, housing and more. The Urban REAP project will be constructed next to the new Jubilee Food Market, a nonprofit grocery store that opened November 2016 to provide fresh, healthy food to the local neighborhood. The fruits, vegetables and fish that are raised with the new aquaponics system in the greenhouse will be sold in the food market. Engineering students in Baylor’s School of Engineering and Computer Science are also getting involved in the project by helping design the solar and rainwater catchment components. To date, the Sun Club, a 501(c)(3) nonprofit, has donated more than $4 million to support over 90 nonprofits across the country through solar and sustainability project donations. To learn more about the Sun Club and how to nominate a worthy nonprofit for a sustainability grant, visit www.gmsunclub.com. Since its founding in 2002, the Green Mountain Energy Sun Club has donated more than $4 million to solar and sustainability projects focusing on renewable energy, energy efficiency and resource conservation in numerous communities in Texas and also in the Northeast. Contributions to the Sun Club® come from Green Mountain Energy Company’s residential customers in Texas, as well as from Green Mountain, its employees and other Sun Club supporters. Green Mountain’s customers are vital to the Sun Club mission of supporting local nonprofit organizations through solar and sustainability projects. To learn more about the Sun Club and to apply for a sustainability grant, please visit www.gmsunclub.com. Founded in 1992, Mission Waco Mission World exists to empower the poor and marginalized, mobilize the middle class toward compassionate and appropriate volunteerism among them, and address systemic issues, which can create barriers in their goals for a healthy and productive life. The faith-based organization has a variety or programs, including urban children and youth enrichment and tutoring classes, job training, a homeless shelter, alcohol/drug residential recovery, a donation health clinic, performing and visual arts, a restaurant and now a non-profit grocery store. The organization also does community development in Haiti. With 70 staff members and hundreds of volunteers, they have been recognized locally and nationally for their work.